DC | No Chic. Just Geek. I’m not going to beat around the bush – I’m just going to come straight out and tell you this. Julie Andrews, movie legend, international treasure, beloved (it would seem) of millions, has decided to lend her talents to her first live-action movie in nearly ten years. Now, if you had told me this a couple of days ago, I would have said ‘Ha ha! Secret cameo! But of course. It was inevitable,’ in the full and certain knowledge of which film she was coming out of (semi-)retirement for. But I was wrong. She is not in the movie you would expect her to be in. Instead, Julie Andrews is playing a giant kaiju-esque sea monster living in a mystical subterranean ocean in James Wan’s Aquaman. This is one of those facts that causes me to wonder if I am having some kind of psychological episode, or at the very least have eaten the wrong kind of cheese. 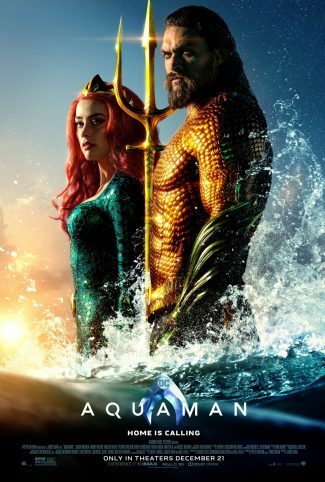 On the other hand, it does give you a general sense of the kind of tenor of Aquaman, which is in no way the film I would have expected a year or so ago. With Marvel Studios cheerfully pumping out three films a year on a regular basis, it feels – perhaps unfairly – a little surprising that their rivals at Warner Brothers/DC should basically have taken most of 2018 off, as we’ve seen nothing from them since last November’s could-have-been-much-worse Justice League. 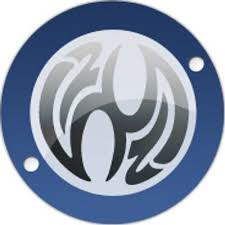 On the other hand, the DC movie line has routinely been met with such eviscerating reviews (I put my hand up unashamedly) and use of words like ‘omni-crisis’ that it’s entirely understandable they should take a breather, listen to what people are saying, and rethink what they’ve been doing. Aquaman is definitely a change of gear. Thirty-odd years ago, lonely lighthouse keeper Tom Curry (Temuera Morrison) is startled to find a woman (Nicole Kidman) in an outlandish outfit washed up during a storm. After a bumpy start (she eats his goldfish and sticks a trident through the TV while Stingray is showing – clearly not a Gerry Anderson fan) romance blossoms between the two of them. It turns out she is Atlanna, queen of Atlantis, in self-imposed exile to avoid an arranged marriage. The pair of them end up having a kid, before her past resurfaces (sorry) and she is forced to leave them both and return to the underwater world. The child is named Arthur and grows up to become the definition of a strapping lad (Jason Momoa), who leads a fairly carefree life when not appearing in other movies as ‘the metahuman known as the Aquaman’ (note the addition of the definite article – which I don’t recall ever seeing applied to the comics version of the character – in an attempt to somehow make him seem more mature and portentous), as he can swim at incredible speeds, breathe water, and talk to fish (historically the source of some embarrassment to writers of Aquaman), in addition being very big and tough. The movie has been practically dancing along so far, but at this point the plot kicks in, which is fair enough – but as much of the exposition is delivered by Dolph Lundgren, with CGI magenta hair, while riding on a prehistoric sea monster, I was rather distracted and not in the best state to take it all in. Basically it goes a little something like this: Arthur’s younger half-brother Orm (Patrick Wilson) is intent on uniting the various splintered kingdoms of Atlantis and having himself declared Ocean Master. His plan to achieve this is to provoke a war between the people of the ocean and those living on the surface. Already King Nereus of Xebel (Lundgren) has signed up. Now, I became aware of Aquaman at a fairly young age, along with most of the other core DC characters. At this point he was still a fairly nondescript chap in an orange shirt whose signature ability (talking to fish) didn’t really match up to running at the speed of light, having an invisible plane, or being able to shoot heat rays out of your eyes. Various attempts to make Aquaman a bit more interesting as a character ensued over the years, with the most effective (if you ask me) being the one done by Peter David (credited on this movie) in the middle 1990s – this would be the version of Aquaman with the attitude, the beard, the gladiator vest and the hook replacing one of his hands. Do I detect the influence of the David Aquaman on this movie? Well, Momoa obviously has the beard and the attitude, so maybe, although ultimately they go back to the orange shirt costume, and don’t bother with the hook (someone did point out it would make it difficult for Aquaman to go to the bathroom, although I’ve never been able to work out how the sanitation in Atlantis would function anyway). Momoa basically plays Aquaman (or Ah-quaman, as some of the people here pronounce it) as a not-especially-bright bro, a take on the character which works in this context even if it’s not particularly authentic to the comics. It’s a perfectly good, charismatic performance, although I suspect the best he can hope for is a Chris Hemsworth level of stardom, where people will flock to see him only if he’s playing one particular role. Perhaps I’m damning with faint praise, for Momoa does do the heavy lifting when it comes to carrying what’s a big, hefty movie. Anyone expecting the kind of industrial gloom of something touched by the hand of Zach Snyder will be in for a big surprise, for there is a very different sensibility at work here: this is a light, fun fantasy epic, somewhat influenced by a bunch of other recent blockbusters (and not just ones from Marvel Studios), with its own very distinct aesthetic – there are garishly-coloured vistas throughout, and all manner of unlikely CGI critters (including, and we mustn’t forget this, Julie Andrews). Perhaps they are overcompensating somewhat, for the grim-and-gloomy of the earlier films has been replaced by a tone which is often as camp as Christmas (shrewd choice of release date, guys), sometimes absurdly so, with a rainbow-hued fluorescent colour-scheme. In the end, popcorn fun results, thanks to a script which hangs together well and doesn’t worry about too many other DC references (there’s an attempted HP Lovecraft in-joke at one point, but they seem to have chosen the wrong book). The film has an interesting, eclectic cast who do good work, on the whole – personally, I can’t believe I’ve turned up to see a major Hollywood release featuring Dolph Lundgren two weeks in a row. His appearance here isn’t as good as the one in Creed II, but could we nevertheless be seeing the start of a Lundgrenaissance? Fingers crossed. I’m not entirely sure what Black Manta contributes to the movie beyond a major second-act action sequence, but then again the character is saddled with an especially silly costume design. Aquaman is such a change of pace for the DC movies series that I’m genuinely curious to hear what fans of these films make of it – apparently there were a lot of complaints that Joss Whedon’s cut of Justice League was just too entertaining and faithful to the comics, and that Snyder’s depressing and misconceived vision should be respected and preserved. We’re off into a whole new world of camp nonsense with this film, and on its own terms it works just fine – I imagine it will do rather well for itself, although this does seem like an unusually crowded Christmas for aspiring blockbusters (in the absence of a stellar conflict movie, everyone seems to be piling in). I’m not sure if this approach will work for any other characters in the DC stable, but then again maybe the trick will be to not worry about the consistency of tone which has been such a mixed blessing for the Marvel films. 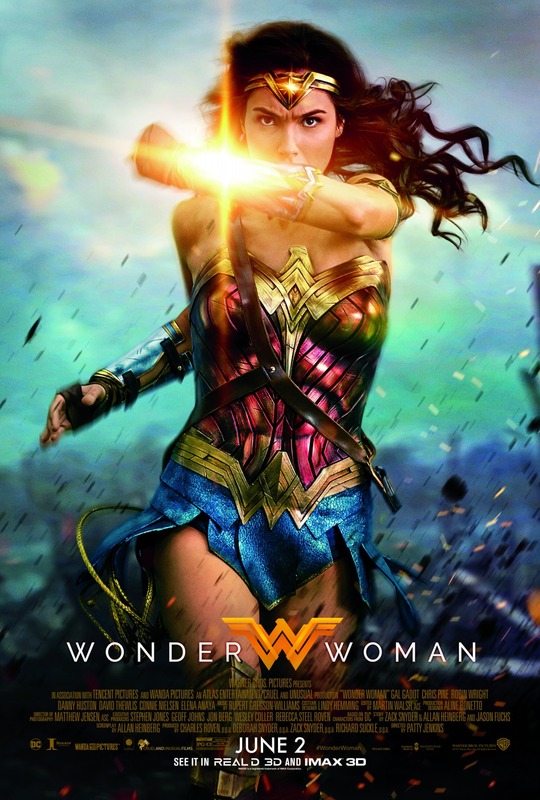 I don’t think Aquaman has quite the same quality as Wonder Woman, but it’s still a very enjoyable piece of silliness, much better than any of the other recent DC films – fingers crossed they can keep this standard up in future. If we’re going to head off the beaten track, cinematically speaking, it occurs to me that Bollywood movies and the like are really just a first step. There are lots of much weirder, more startling films out there in the world, as I discovered at quite a young age – you can imagine the astonishment which resulted when I first encountered masked Mexican wrestling horror movies, for instance. The problem, such as it is, is that some of these foreign treasures are just a bit too strange to be really accessible to a western viewer. Striking some kind of balance between being recognisable and having the sheer utter capacity to smack gobs is the twilight world of Turksploitation movies. You what? is a perfectly reasonable response. I speak of the charming Turkish habit, in years gone by, of taking popular American blockbusters and doing a local remake, without bothering with trivial little things like the legal rights to characters and stories. Needless to say, these films were often cobbled together on tiny budgets, using performers highly unlikely to ever get the call from Hollywood. And yet they sometimes have an exuberant charm of their own, as well as a entertainment value born of their sheer crudeness. 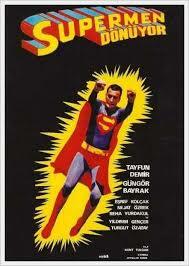 As a case in point, let us consider Süpermen Dönüyor (aka The Return of Superman), a fairly representative Turksploitation movie, made in 1979 by (stop sniggering at the back) Kunt Tulgar. I suppose the closest thing to this kind of film being made today are the ‘mockbusters’ plopped out by The Asylum, the crucial difference being that Asylum movies are carefully tweaked to avoid lawsuits – I speak here of the likes of Snakes on a Train, Transmorphers, and Sunday School Musical – whereas the Turkish films just totally ignore the dubious legalities involved. We open in deep space, which is realised using a selection of Christmas tree ornaments on a black blanket, while a voice-over fills us in the history of planet Krypton (which closely resembles one of those shiny bauble thingies). The title card with the Superman S-shield on it appears (apparently painted by an eight-year-old), while John Williams’ famous fanfare plays. Then abruptly the music changes to something with more of the flavour of the souk about it while the rest of the credits roll. With all this out of the way, we meet Tayfun (Tayfun Demir), a young man in a pair of Elton John’s old specs, who is just about to start making his way in the world when he receives a shocking revelation from his parents – he is adopted! Apparently they found a ‘rocket-like machine’ in the garden one day, with him inside, along with a sort of greeny-grey rock. Tayfun takes this extraordinary news with superhuman stoicism (either that or he’s a terrible actor – hmm…) and sets off to follow his destiny. This turns out to be to go into a cave, where he is confronted by the ghost of his father, Superman, leader of the planet Krypton, a world of supremely advanced science in all areas but dentistry (judging from the state of Superman’s mouth, anyway). Tayfun is to carry on the legacy of Krypton by being the new Superman of Earth, using his special superhuman powers in a surprisingly low-key and cost-effective manner. Having learned all this, and adopted the traditional red-and-blue uniform (possibly the most impressive and expensive-looking thing in the movie), Superman flies off in search of adventure, and also to get a job. The scenes of our hero in flight are realised by – well, not to put to fine a point on it, sticking a doll in front of back-projected helicopter shots of famous Turkish landmarks. The results are breathtaking, one way or another. Tayfun lands a job at what seems to be an extremely small Turkish newspaper (there only appear to be three other people on the staff), just in time for the plot proper to kick in – The Return of Superman is a (some would say blessedly) brief 68 minutes long, so there’s less of the hanging about you get in the Richard Donner version. Scientists have discovered the mystical ‘Krypton stone’, which will either provide an unlimited supply of cheap, clean energy (seriously, given this is a maguffin in so many superhero movies nowadays, The Return of Superman is way ahead of the curve here), or allow unscrupulous types to transform base substances into gold and get rich quick. Any tiny remnants of credulity left in the audience will be cruelly squished when it turns out that that the professor in charge of investigating the Krypton stone is the father of Alev (Gungor Bayrak), Tayfun’s co-worker and love interest. Cue many opportunities for Alev to be menaced and repeatedly kidnapped by the mob as they attempt to get their hands on the Krypton stone, and for Superman to race to her rescue in his understated Turkish way (faced with a runaway truck, for instance, Turkish Superman does not plant himself in its path or grab it and bring it to a halt, he climbs in through the cab door and steps on the brakes – not exactly spectacular, but it saves on special effects). In the end the villains are defeated, Tayfun has revealed his secret identity to the smitten Alev, and everyone asks if Superman will stick around to fight for truth, justice, and the Turkish way. No, he announces: he’s off to look for Krypton, which he lost ‘seven light years ago’ (according to the English subtitled version, anyway). The End – and it certainly feels like it. As an unauthorised foreign language rip-off, I expect it goes without saying that The Return of Superman is a terrible, terrible movie by any rational standard – the acting is awful, the subtitled dialogue is awful, the direction and editing are awful, and the special effects are awful. Normally I might even have some strong words to say about the dubious ethicality of this kind of undertaking, but given that DC Comics’ own treatment of Superman’s creators was hardly exemplary, I’m inclined to give them a pass. But seriously – is there any reason to spend an hour of your life actually watching this? Well, for the first few minutes at least, the sheer primitive incompetence of The Return of Superman makes it utterly hilarious to watch, but one becomes habituated to this with surprising speed, and only particularly striking moments really register: for instance, Superman’s suggestion to the professor upon rescuing him is ‘There’s a car outside – run away with it!’ There’s also a wholly tonally wrong sequence in which Tayfun uses his x-ray vision to check out a passing woman’s underwear – although I should say that, on the whole, this movie’s depiction of Superman is at least as authentic as that of the average Zach Snyder movie – while Superman does appear to kill a guy at one point, the actor reappears five minutes later, but this may just be down to the awful continuity. It’s not like he goes around wantonly snapping necks or allowing himself to be manipulated into picking stupid fights with people, anyway. Probably the most fun to be had while watching The Return of Superman comes from playing Name that Tune. The makers of this movie clearly realised the importance of music to a proper cinematic experience, but couldn’t afford an original soundtrack for their film. So (and you may be ahead of me here) they went away and nicked bits from various popular American and British films and TV series. Quite apart from the 1978 Superman (of course), unwitting donors to this movie’s (un)original soundtrack include From Russia with Love, Goldfinger, You Only Live Twice, Westworld, and Space: 1999. It is frequently laughable, especially when the music is slapped on randomly over a wholly inappropriate moment (one of John Williams’ more up-tempo action cues accompanies a bafflingly long and entirely dialogue-free scene depicting Tayfun packing his suitcase). But in other places you are reminded of just how important a good soundtrack can be to the success of a movie – moments which should be absurd actually acquire a vestige of emotional or dramatic value when the film-makers get their act together and dub the right piece of music over the top of their tosh. For this reason, if no other, I find it a little hard to dismiss The Return of Superman quite as comprehensively as it probably deserves: the people who made it may have been an underfunded bunch of pirates, but they do appear to have had a genuine affection for and understanding of both Superman and cinema, and that makes up for a lot. Not enough to make this film any more than a bizarre and deservedly obscure oddity (it’s currently available to view on YouTube, if you really must), but if it teaches us anything, it’s that sometimes you just have to make do with what you’ve got. I’m hearing a lot of talk about ‘superhero fatigue’ at the moment – the notion that somehow people are going to get sick of seeing a new comic-book movie come out, on average, about once every two months. Hmmm, well – having lived through many years when there were no decent superhero movies to speak of, once every two months strikes me as being just about right. You’ll notice I said ‘decent’, because the likes of Steel, Catwoman, and Superman IV: The Quest for Peace have always been with us. Provided the standard stays high I see no reason why people will stop watching. That’s a big assumption, though. Quite what dark art Marvel Studios have employed to produce so many movies in a row without a significant misstep I don’t know, but – and I’m aware this assertion is going to be met with bared teeth by some people – if you want to see how this sort of thing probably shouldn’t be done, you can always take a look at DC’s recent movie output, for they haven’t released an entirely unproblematic film since The Dark Knight Rises, four years ago. Still, you can’t fault their determination, for they’re at it again with David Ayer’s Suicide Squad. It sounds like a winning premise: with Superman indisposed (i.e., and spoiler alert, dead) following the end of Batman Vs Superman, and Batman and Wonder Woman off the scene, the US government is concerned about who’s going to pick up the slack if another giant alien monster goes on a rampage. The solution comes from ruthless government agent Amanda Waller (Viola Davis) – get a bunch of the villains previously defeated by Batman and other superheroes, fit them with remote controlled explosives to ensure compliance, and deploy them as a deniable task force of superpowered operatives. The collection of nutters thus assembled is led by top soldier Rick Flag (Joel Kinnaman), and includes ace marksman Deadshot (Will Smith), the Joker’s girlfriend Harley Quinn (Margot Robbie), human flamethrower El Diablo (Jay Hernandez), atavistic cannibal Killer Croc (Adewale Akinnuoye-Agbaje), immortal sorceress Enchantress (Cara Delevingne), and the Australian villain Captain Boomerang (Jai Courtney), whose main superpower is being a ridiculous national stereotype. 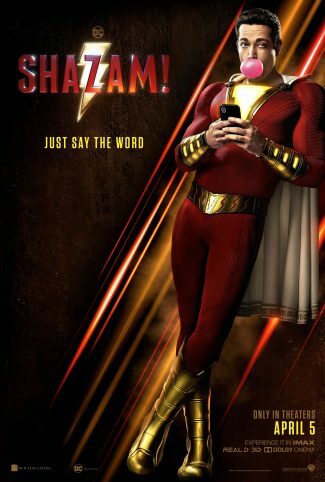 Is it overstating things to say that DC’s movie division seems to wobble from one crisis to another in a perpetual state of omni-shambles, with virtually every news story about them featuring the words ‘urgent talks are in progress’? Well, maybe. But there were apparently heated discussions after the relative underperformance of Batman Vs Superman, and even before that suggestions that this film was being reshot and reedited to give it more of chance of hooking the audience that made Deadpool such an unexpectedly big hit. It certainly has the whiff about it of a film that has gone through extensive surgery in the editing suite: key plot beats are critically underdeveloped, and the structure of the film is odd and lumpy, often at the expense of the storytelling. Most of the Squad are given fairly detailed introductions, especially if they’re played by an A-list star, but then just as they’re about to go off on the mission, a brand new member turns up with no introduction at all (and a frankly rubbish superpower) and you just think ‘This guy is clearly just here as cannon fodder who will die in the next ten minutes’ – and he does! Not that the film couldn’t do with losing a few characters – super-obscure superhero Katana turns up, played by Karen Fukuhara, and does pretty much nothing at all. (Fukuhara says she wants to ‘explore the character’s back-story’ in the sequel, and it’s easy to see why: she has virtually no back-story here and is essentially just another national stereotype.) You could even argue that the film would be significantly improved with the Joker completely excised, for he has nothing to do with the main plot and just capers about bafflingly on the fringes of the film. No chance of that, of course, for DC are clearly fit to bust, such is their desire to get their universe up on the screen in the mighty Marvel manner. I have to say I think there’s something deeply weird about this movie being made at all, at least now. This version of the DC universe hasn’t done a standalone Batman or Flash movie so far, and yet they seem convinced there is an audience dying to see a film about second- and third-string Batman and Flash villains in which the heroes themselves barely appear. I suspect the Joker is probably the only major character in this movie which a mainstream cinema-goer will even have heard of, which is probably why he’s in it. Then again, there probably is an audience dying to see this kind of film, it’s just a very small audience of comics fanatics. One of the key moments in the development of the modern comic book movie was the failure of Batman and Robin in 1997, which the studio apparently decided was not because it was simply a bad movie (to be fair, I still think it’s better than Batman Forever), but because it managed to alienate the core comic book fan audience. This audience is lovingly courted at great length these days, and you could argue that with Suicide Squad we see a movie made solely to gratify it, and which has started to forget that the mainstream audience is the one which actually turns a film into a genuine blockbuster hit. Still, given an arguably less-promising premise than that of Batman Vs Superman, David Ayer does an impressive job of keeping the film accessible and entertaining, even if it feels more like a handful of really good moments scattered through a rather generic and predictably murky superhero film. Will Smith earns his top billing, bringing all his star power to bear as Deadshot (the film predictably favours Smith over some of the others), while no doubt Margot Robbie’s game performance will win her many fans. Too many of the other squad members are one-dimensional – I would have liked to see rather more of Captain Boomerang in particular, but they seem to have realised such a wacky character is a terrible fit for a film striving desperately to be dark and edgy, and he barely throws a boomerang or gets referred to by his codename throughout. 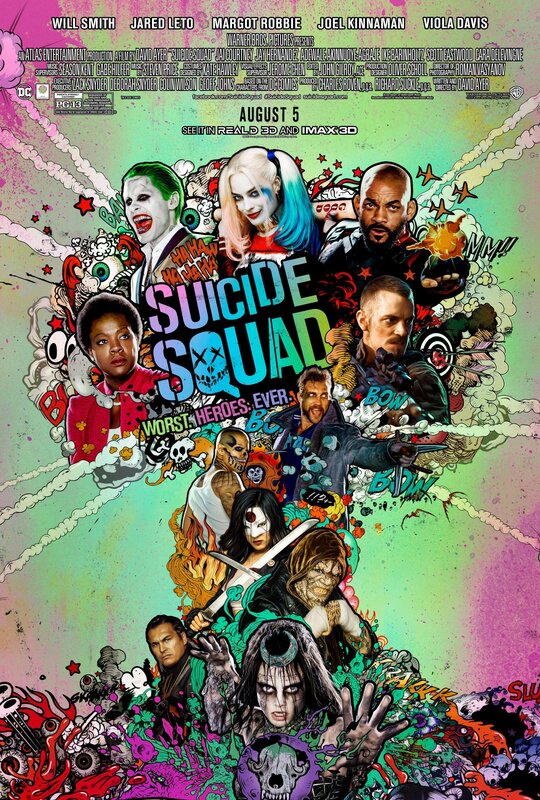 In the end, Suicide Squad is a bit of a mess on virtually every level: it’s arguably a bad idea to do this movie at all at this point in time, and its structure and storytelling are both rather suspect, to say nothing of its oddly inconsistent tone (most of the time it plays like black comedy, but some of its most effective moments are when it takes its characters seriously). As an ensemble piece, it doesn’t really work either, being too strongly skewed in favour of certain characters. That said, it’s not an un-entertaining mess, with some amusing and effective moments along the way. I didn’t come out of it wanting to hunt down and exact vengeance on the director, which was the case after Batman Vs Superman. This wouldn’t really qualify as a ringing endorsement under normal circumstances, but these are not normal circumstances: we are in the odd world of DC’s movie output, and they do things differently here.